Information related to pupil premium, disadvantaged children and free school meals can be found in the sections below. I think my child may be entitled to free school meals? How many Branston students are pupil premium? How much money does Branston get for Pupil Premium students and how is it spent? What does Branston do for its Disadvantaged students? What impact does the Pupil Premium Spending have on Branston students? Staff at Branston are committed to raising the achievement of all our students. In 2011 the Government introduced the Pupil Premium funding. Currently this funding is provided for the groups of children listed below. The Government refers to these students as ‘disadvantaged pupil premium’ students (DPP). In addition, it provides funding of £300 per year for children from services families. In this case parents must ensure that they have told the school that their child is from a service family. If you need to inform us then please contact us. Further information from the Government may also be found here. If you think you are entitled to free school then please complete this online form. Alternatively, follow this link to a Printable Form which you may complete and return to the school c/o Mrs H Marriott. Currently 27% of our students receive Pupil Premium Funding. 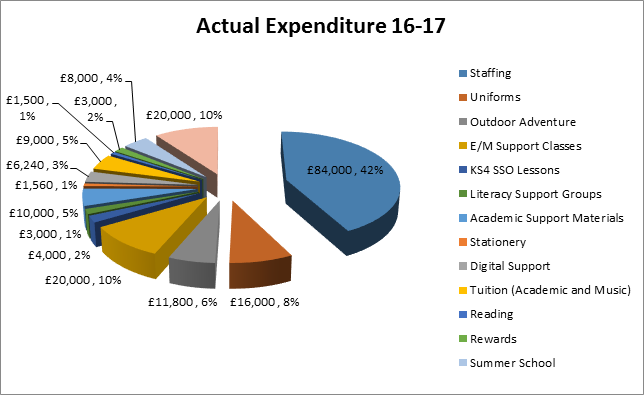 Our budget for 2017-18 is approx. £200,000. We have mapped our provision against the latest research to ensure that we are spending our funding on worthwhile resources and activities. We have linked our school provision to the research published in the Education Endowment Toolkit. Our starting point is to ensure that we secure success for all students within the Academy. We have developed a series of Pledges that we work towards as an entitlement for our pupil premium students. We also believe that establishing excellent working relationships with families is essential. We work with our Primary partners to identify Y6 students joining Branston in Year 7. Families are invited in for a face-to-face meeting with our Pupil Premium team during the summer term of Y6. In 2017 62% of parents attended this initial meeting. Each Y6 student is invited to a Summer School during the holidays to ease transition in September. In July 2017 61% of eligible students attended the summer school (see a sample of our summer school feedback below). Once students join us they will receive regular meetings with our specialist Pupil Premium mentors. The main principle of these meetings is to manage learning, review progress and identify and allocate resources. We work closely with a local uniform manufacturer to provide free uniforms discreetly at the end of each academic year for DPP students. Last year we had 100% uptake. In addition, we also ensure that DPP students have continuous access to both basic and specialised stationery and equipment, educational trips, reading books, additional subject tuition, music lessons, sports lessons, transport, reward trips, school Christmas meal and support to complete our pledges. Students also receive support throughout each academic year. Key Stage 4: GCSE subject materials and revision guides, Duke of Edinburgh Award, Annington Trust Outward Bound, laptop, Prom ticket and the KS4 reward trip. We gathered feedback from each participant from our summer school 2017. At the end of each academic year we write to parents to gather their view about our pupil premium provision. 100% of parents that responded said they found the additional meeting extremely useful. 100% of parents that responded rated our Pupil Premium provision as Excellent. Students’ progress is regularly reviewed and intervention strategies put in place where appropriate. The purpose of the Pupil Premium funding is to close the gap between the performance of Pupil Premium students and the performance of all other students. We have analysed our GCSE results for the past three years and a post examination report can be found here. We work closely with the Careers Service to ensure that all of our students progress on to post-16 courses or apprenticeships. Other approved post-16 destination eg further education, apprenticeship etc.